The potential of the Asian-Pacific region is huge and is yet to be fulfilled. The future belongs to the region but the current global problems have already presented it with serious challenges. 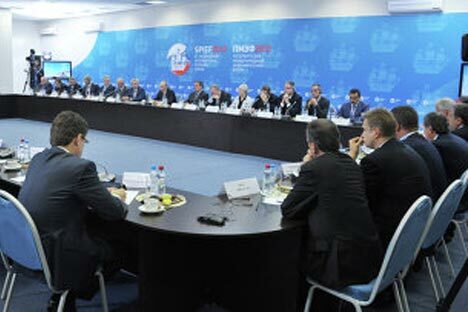 These issues were discussed at a session entitled “Asia Pacific: economy, challenges and opportunities” held on the sidelines of the International Economic Forum in St. Petersburg. The character of the discussion about the future of the Asian-Pacific region differed significantly from many other of the Forum's events. It was expected that the discussion would add another chapter to the “book on investments and investors” because during the forum numerous statements were made that many countries, including Russia, which is hosting the forum, and a number of African countries, are waiting for investors. The discussion of the future of Asia Pacific in particular and the agenda of the regional forum which is due to be held in Vladivostok in September, concerned mainly the challenges and threats faced by the region. At the very beginning of the discussion a statement was made that the crisis in Europe had made Asia Pacific more vulnerable. Goldman Sachs Asset Management Chairman Jim O'Neill elaborated on thechallenges the region may face in the future. China is also facing domestic problems. The participants of the discussion agreed that in the near future China would lose its leading positions. President of Hyundai Energy & Resources Mr. Bon-jing Young touched upon the causes of these problems. Because of the problems it is currently facing, China won’t be able to become a global leader, the expert concludes. This means that Russia will have the opportunity to win back its leading positions in Asia Pacific. For Russia this process will be closely linked to the development of Eastern Siberia, where the main problem at present is poor infrastructure. To solve this problem, the participants of the discussion proposed to enhance ties between the government and business. According to the head of VTB Bank Andrei Kostin Russia needs to create the necessary conditions in Eastern Siberia to enable Japanese and Chinese businessmen to resolve their business needs in Vladivostok and Khabarovsk instead of having to fly all the way to Moscow. The economic partnership between Russia and Asia Pacific nations should develop there as an integral part of the Russian economy. At the end of the discussion, the former Finance Minister Alexei Kudrin left no chances for pessimists to doubt the bright prospects for the development of the Asian-Pacific region. The region comprises the world’s two greatest economies, the US and China, which combined with Japan and Korea, as well as Russia's land and natural resources, create a vast development potential, he said. “Our mutual interests are so strong that I would say that the region's potential has not been fulfilled, first of all for Russia. Today, Russia is one of the countries interested in unlocking this potential the most”, Kudrin said. The participants of the discussion were left in no doubts that this potential will be unlocked. Asia Pacific is the perfect venue to help the regional powers find compromises and create alliances.